Thousands of striking university students are marching through Barcelona to protest what they call an intensifying central government crackdown on Sunday’s planned independence referendum in Catalonia. The students are demanding the right to vote in the regional ballot on secession, which the Madrid-based national government says is illegal. Many protesters are carrying pro-independence flags and handmade banners, with slogans such as “we want to vote.” The march Thursday and the strikes were called by Catalonia’s main student unions. A media watch dog says pressure by the Catalan government and social media harassment by “hooligans ” of the pro-independence movement is making for a suffocating atmosphere for journalists trying to cover the planned Oct. 1 independence referendum in the northeastern Spanish region. 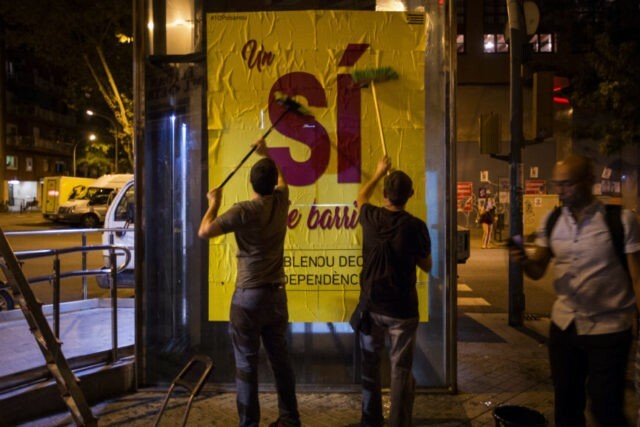 It added that Spanish authorities’ judicial measures against Catalan media to stem propaganda for the referendum have created an atmosphere of extreme tension. Catalonia’s foreign affairs chief has appealed for support from the European Union before a disputed referendum calling for independence from Spain. Raul Romeva, speaking to journalists Thursday in Brussels, said that EU institutions need to “understand that this is a big issue.” Romeva spoke a day after Catalan regional president Carles Puigdemont accused the EU, in an interview with The Associated Press , of “turning its back” on Catalonia in its conflict with Spain’s central government.